Carefully place a barbell of desired weight on the upper back muscles (trapezius). To do so the barbell will normally have to be pressed overhead and then lowered behind the neck. Stand with the legs about shoulder with apart. Take a step forward while keeping the rear leg outstretched behind the body, while also keeping the torso as straight and upright as possible, and inhale throughout the motion. Once the forward thigh has reached horizontal with the ground or slightly below, press with the leg, exhaling throughout the motion, and either assume an upright standing position or, for more of a challenge, continue into the next lunge with the opposite leg. When in the lunge position, a good sense of balance is necessary, for the majority of the weight is being supported by the front leg alone. If unsure, begin by using only one's body weight, then gradually add weight as one's comfort level increases. When a shorter step is taken, the thighs will be more involved. 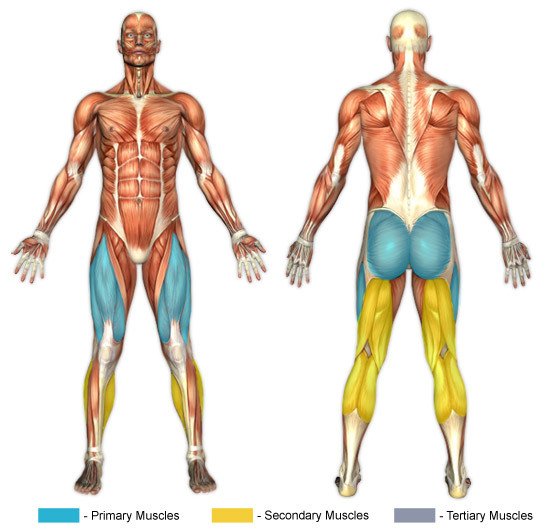 When a longer step is taken, the buttocks and hamstrings will be more involved, and as a consequence of this longer step the illiopsoas (hip muscles) and the rectus femoris (of the quadriceps) will be stretched. Lunges can be performed one leg at a time--which, generally, entails stepping forward and then once the lunged leg is horizontal (or near it), pressing backward with the lunged leg into the standing position, rather than forward with the opposite leg. In this manner one leg may be repeatedly exercised for the entire set or the legs may be alternated as in the case of walking lunges. On the other hand, walking lunges, which necessarily work the legs in an alternate fashion (due to the nature of walking), require much balance. The calves are worked slightly during lunges, but only insofar as they aid in maintaining balance. If there is knee pain, try working with only one's body weight or light weights. Keeping the back straight lessens the strain on the lower back. With the overhead weight, it is sometimes easy to break form and lean forward, thus causing unwanted lower back stress.